I've finally had a few moments to process the photos from two weeks back when I went to the wedding of my Spanish teacher and one of my colleagues. Apart from the whole getting married bit, a Galician wedding focuses mostly around seafood, and this one was no exception, with course after course of stunning lobster, crab, langoustine, clams and more, all washed down with a rather fine white wine from the region of the Ribeira Sacra. As with all things Spanish, retiring early is simply not on the cards and the wedding crowd finally dispersed into the early morning drizzle at around 7am. A very enjoyable evening and I'll certainly be heading back to Ourense, the closest city to the village where the wedding was held, for some sightseeing. Confetti are sweets of Italy -- sugar-coated almonds -- the origin of the word is unknown to me though. And you may be surprised but it was (and probably still is) thrown at weddings in some regions. More common is to throw rice, which symbolizes good luck or fortune. Coriandoli is the Italian word for coriander, which was thrown during Carnival. Because of the dangerousness of the thing the invention of "coriandoli", which as you know are pieces of (usually colored) paper. About Italian words in English. First time I got to US pepperoni was one of the things that got me confused because of the meaning, along with bimbo, guido and the sort. Hi Luca, thanks for the information. 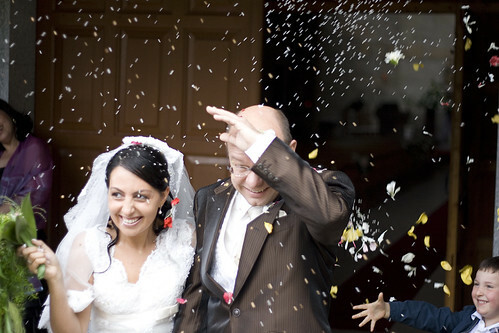 So we weren't too far off in thinking that confetti was what you threw! I haven't found as many words in Spanish which we mangle as in Italian, though I'm sure there are some. Confetti at wedding (I think especially in the South, in the North rice is more common), coriander at Carnival. Anyhow. The story goes that coriander was thrown as it is, namely the seed which is pretty rough, but because people love excess they started to cover it with other stuff making it bigger. Or so is what my dad told my brother and me, when we were kids.